Prophet Mohammad PBUH is the reason of creation of the universe and the pride of existences. Allah adorned the whole universe and celebrated the great event of His beloved Prophet’s birth. Not only the sacred Companions celebrated his birth but also their companions and then their followers celebrated the same way. Afterwards his successors of the heritage of Faqr the Perfect Fakirs and Mystics also had been enlivening Allah’s Sunna and that of the Companions. Even the lovers of Prophet Mohammad celebrate the jubilations of his birthday with a great zeal and decorate their streets and houses. 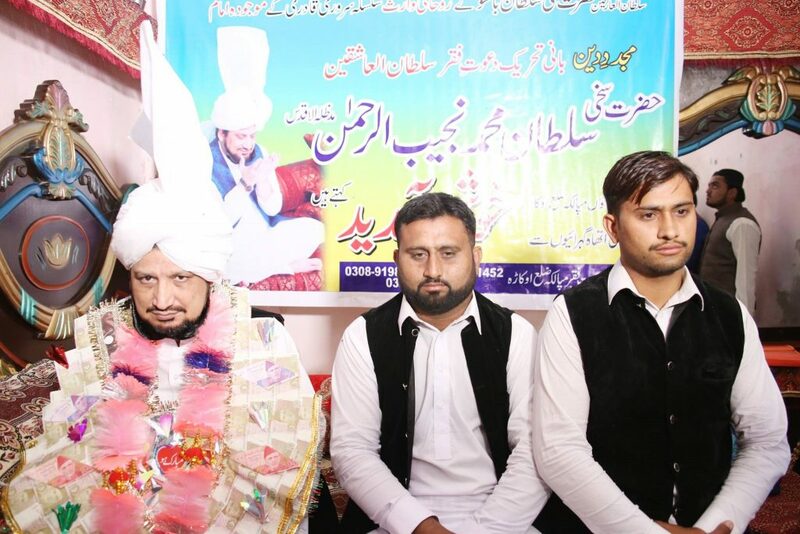 Following the leaders of Sarwari Qadri Chain Sultan Mohammad Najib-ur-Rehman holds a grand function of Mawlid every year. 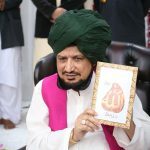 According to the rule of his mystic order this year too he got the Mawlid celebrations held on a grand scale. 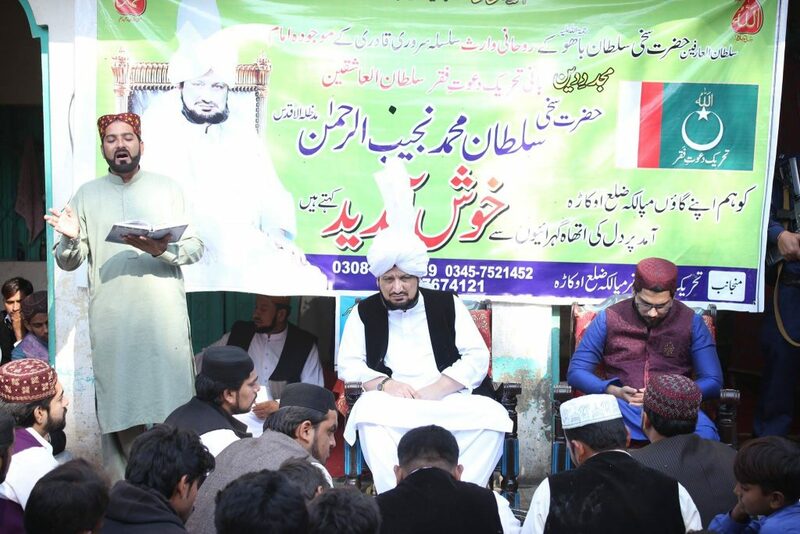 The administration of Tehreek Dawat-e-Faqr did the best arrangements for the great assembly. 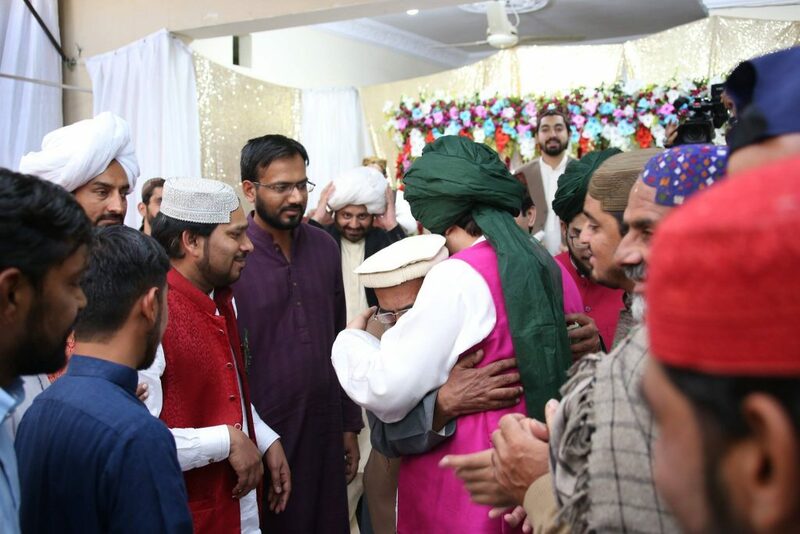 The administration of Tehreek Dawat-e-Faqr sent invites to all disciples across the country and they decorated the exteriors as well as the interiors of Sultan-ul-Ashiqeen House and Khanqah with flowers and lights. 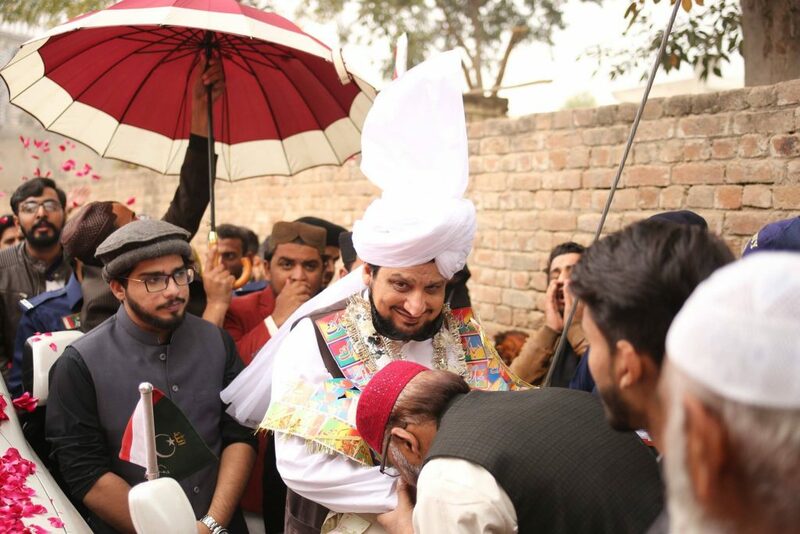 A warm welcome with showering rose petals for Sultan-ul-Ashiqeen was given and the chants of “Sultan-ul-Ashiqeen” were resounding. After his appearance on the stage all his disciples one by one got the honour of kissing his hands respectfully. At the same time the program started. Malik Mohammad Naeem Abbas hosted the program. 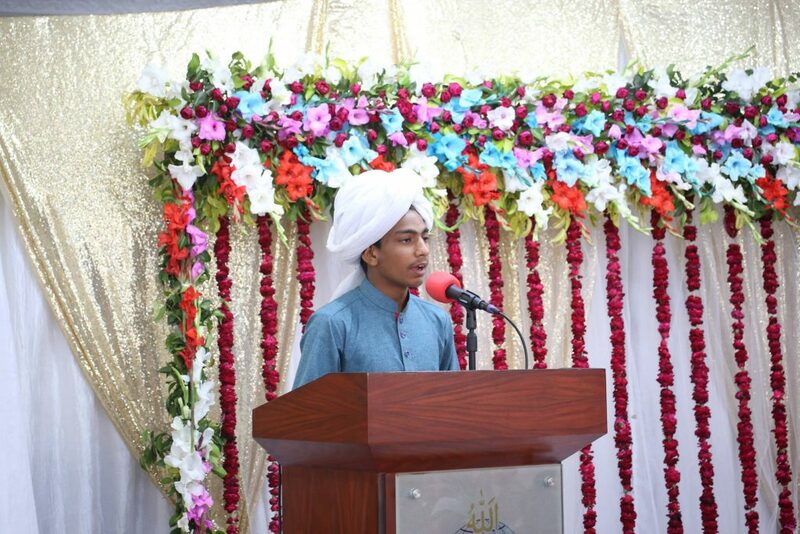 Abid Hussain Sarwari Qadri recited from the Holy Quran. 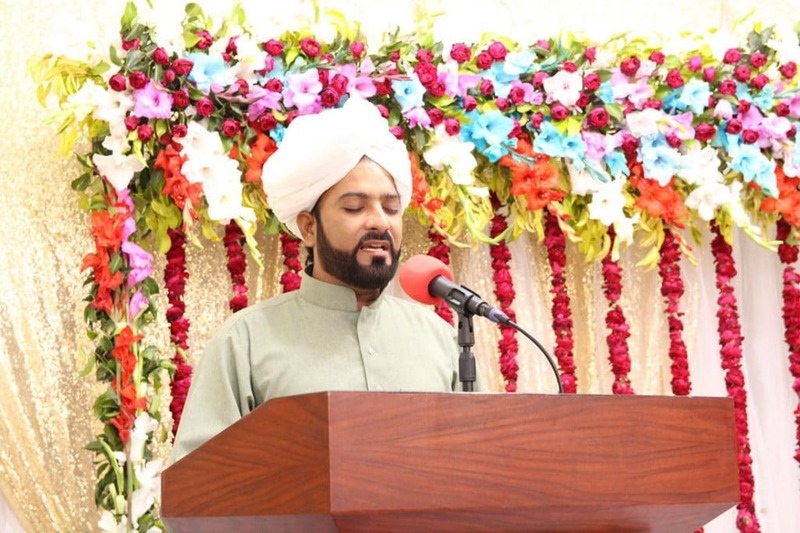 Sajid Ali Sarwari Qadri presented an encomium in the honour of the Holy Prophet. 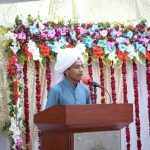 Then Mohammad Ramzan Bahoo also recited some praising words for the Holy Prophet. 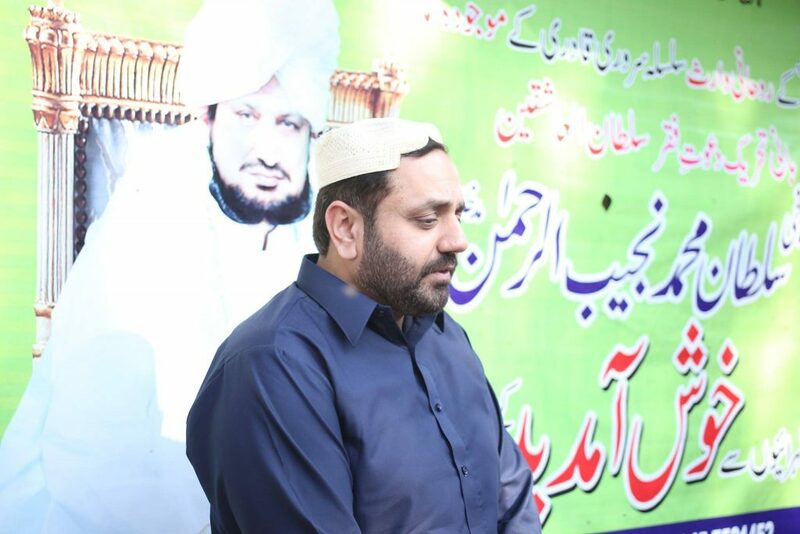 Mohsin Raza Sultani added fervently saying his Naat to flavour the event. Meaning of Naat: Only Prophet Mohammad knows the greatness and bounties of God and only God knows the place and station of His Prophet. 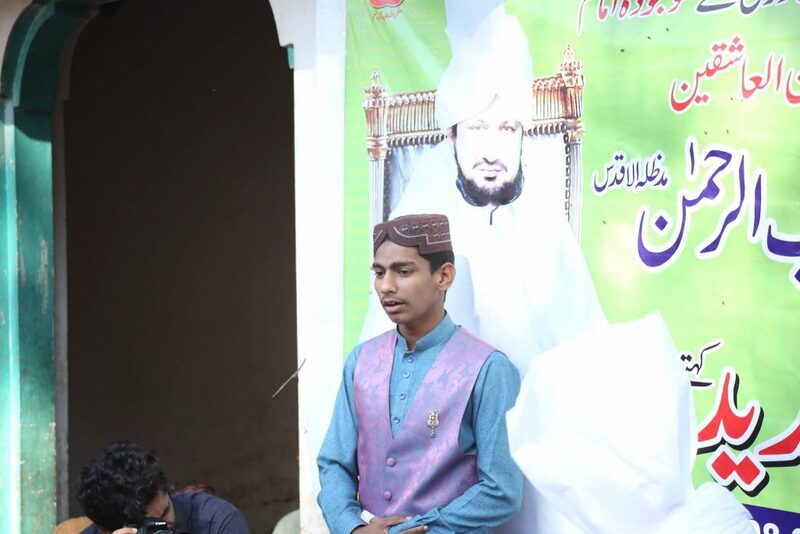 Mohammad Farooq Zia delivered a speech on the topic “Perfect Faith is the love of Prophet Mohammad”. He told the audience that faith is incomplete until and unless Prophet Mohammad is endeared more than anything else. Love of the Prophet is the base of the perfection of faith. 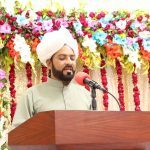 He also told some events of the Prophet’s love from the Companions’ life history. 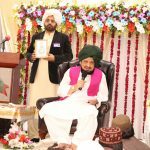 At the end Sajid Ali Sarwari Qadri presented the couplets of Sultan Bahoo. 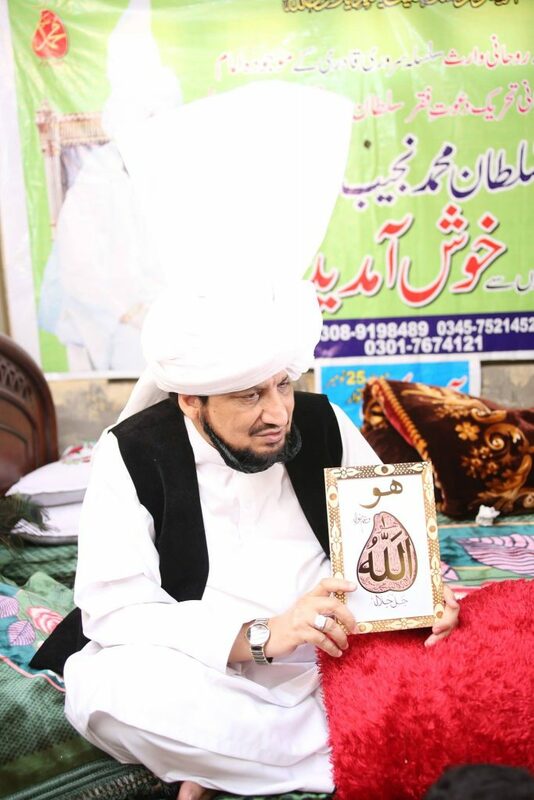 On this occasion Sultan-ul-Ashiqeen distributed Ism-e-Mohammad among the true seekers of Allah. These seekers spend their precious time in serving the Mohammadan religion. He then announced to honour the disciples with Ism-e-Mohammad twice a year from next time onwards. Once on Eid Mawlid of Nabi and then on 21st March the day of transference of Divine Trust. 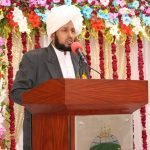 Maulana Mohammad Aslam Sarwari Qadri recited some verses to convey reward to the souls of the dead. 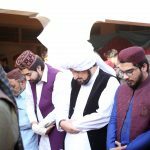 Mohammad Farooq Zia Sarwari Qadri conducted praying ceremony. In the end Sajid Ali and Mohsin Raza Sultani sent peace and Darood in the court of the Prophet. After the Zohr call the congregational salat of noon was offered. 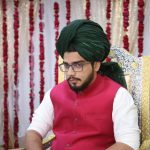 Afterwards the spiritual guide Sultan Mohammad Najib-ur-Rehman took oath of allegiance from the fortunate seekers of Allah. After that he granted them invocation, contemplation of Ism-e-Allah Zaat alongwith the practice of inscribing name of Allah on body. 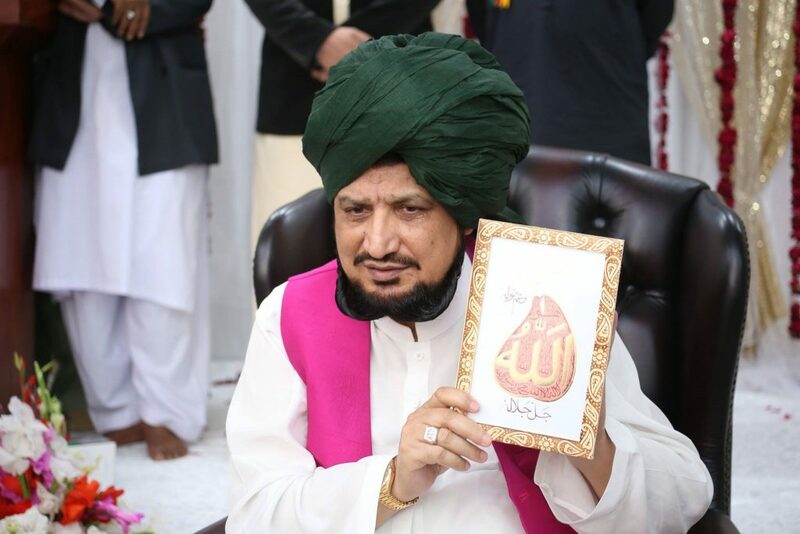 He granted them last resort of Ism-e-Allah Zaat the invocation of Hoo the Sultan of invocations. Hundreds of devotees got the first stage of invocation of Ism-e-Allah Zaat without oath of allegiance. Then our spiritual guide left after meeting his disciples and devotees individually who came from remote areas. 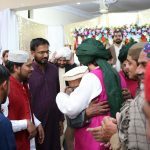 Afterwards a lavish langer (food) was served among the people which was especially prepared for the function of Mawlid. However, Mrs. Najib-ur-Rehman also conducted a grand program on this occasion for ladies at the Sultan-ul-Ashiqeen house. 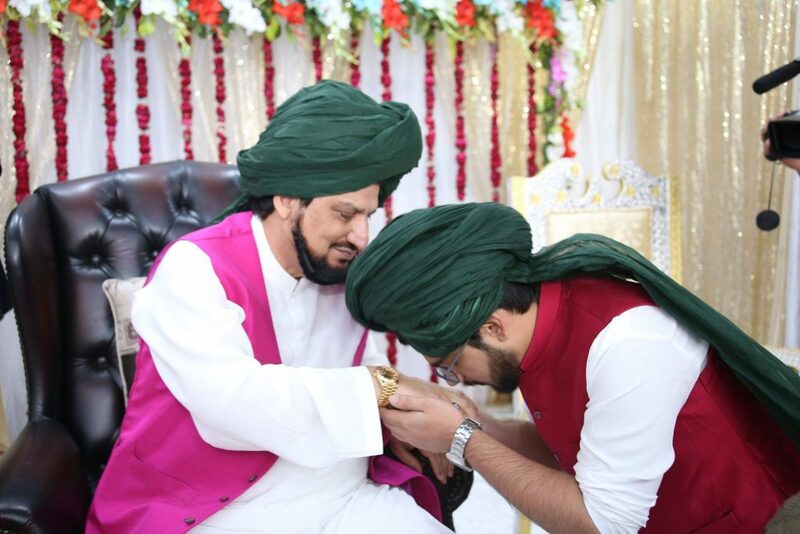 Sultan Mohammad Najib-ur-Rehman granted Sahibzada Sultan Mohammad Murtaza to be his spiritual successor on such blessed moments. 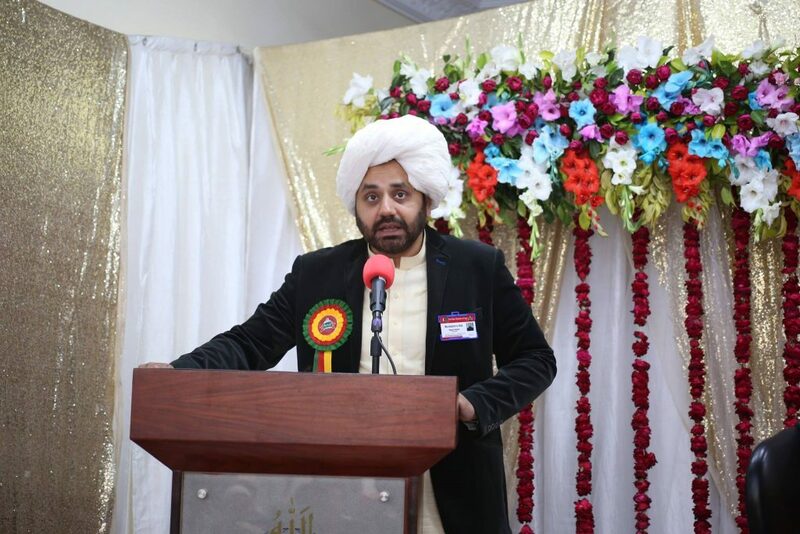 He also announced that Sahibzada would be the head of the sacred family and the shrine superior after him. He advised his son to be nice to his sisters after him and never prevent anyone to visit his shrine. 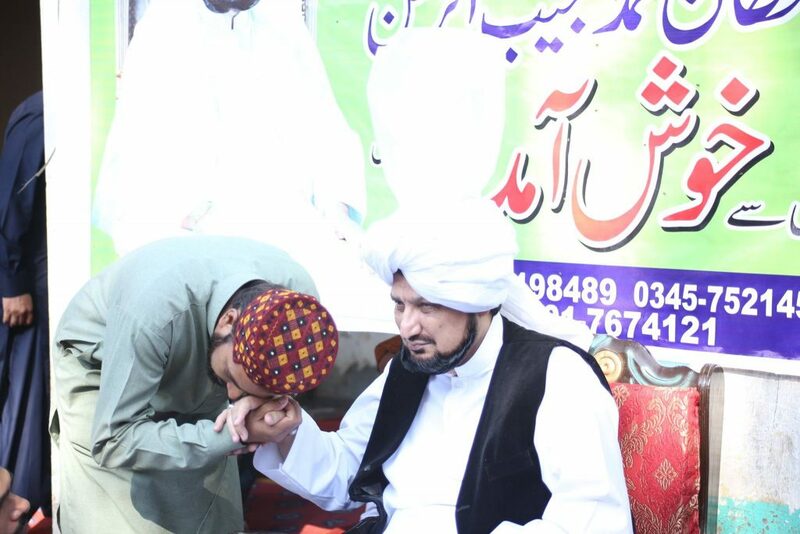 Afterwards he advised all his followers to respect Sahibzada and same is the order for the successors after him. The news of this spiritual succession is given to all disciples across the world. At this happy occasion Insha-Allah all the fair wishes of the followers were accepted in the Divine Court. 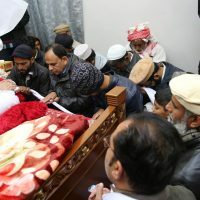 May Allah keep Sahibzada Sultan Mohammad Murtaza Najib safe and sound. Ameen! “Unless a man becomes perfect in invocation and contemplation of Ism-e-Allah Zaat he cannot get rid of the sensual appetites”. To spread the beneficence of Ism-e-Allah Zaat the contemporary perfect spiritual guide visits entire country the whole year. Thus he unfolds the reality of the path of gnosis upon lovers of Allah through Ism-e-Allah Zaat. More and more people can achieve success in their purpose of life by getting this great blessing the Divine gnosis. 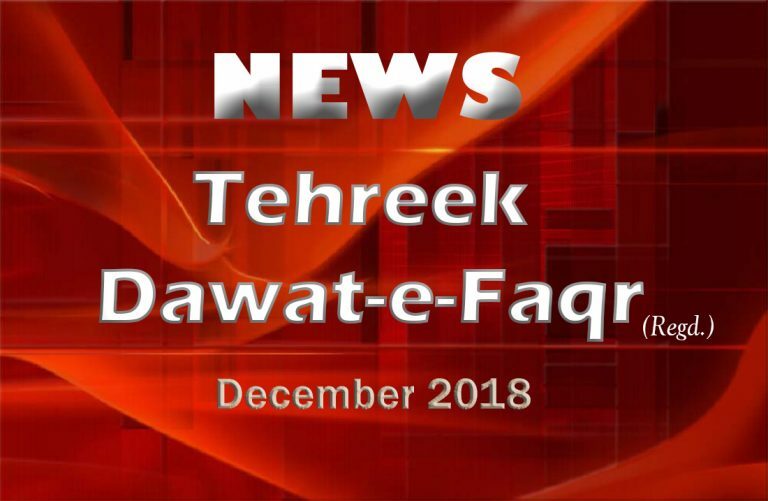 Therefore the administration of Tehreek Dawat-e-Faqr announced a tour towards Mopalkay and Gubba Fazil Okara on 25th November 2018 Sunday. As the disciples of the areas made appeals for the visit. A number of followers requested to join the caravan. 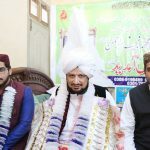 The caravan departed on 25th November 2018 Sunday at 07:00am from Lahore under the supervision of Sultan-ul-Ashiqeen. The caravan arrived at Mopalkay at Mohammad Afzal’s house. 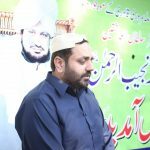 He is the general secretary of the regional office of Tehreek Dawat-e-Faqr Okara. 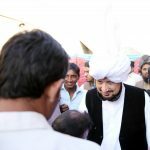 People warmly welcomed Sultan Mohammad Najib-ur-Rehman and his son with echoes of Allahu Akber and other chants of prophethood. The reception was noticeable enough that the people of the surroundings also gathered around. 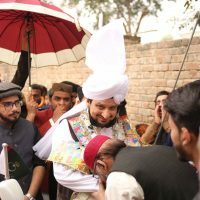 Sultan-ul-Ashiqeen’s personality was so charming that impressed all the viewers and they kept beholding him at a stretch. Then a lavish breakfast was arranged for the whole caravan after which a program of reciting encomium was held. 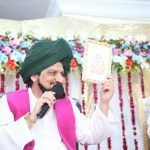 As soon as the perfect spiritual guide Sultan Mohammad Najib-ur-Rehman the chief guest entered, entire atmosphere echoed with the chants. As soon as he took his seat the audience could not revert their eyes from his Divine personality. It is his marvel that once somebody beholds his sacred face he cannot control his eyes and heart. The formal initiation of the function took place with the hosting of chief administrator Malik Mohammad Naeem Abbas. 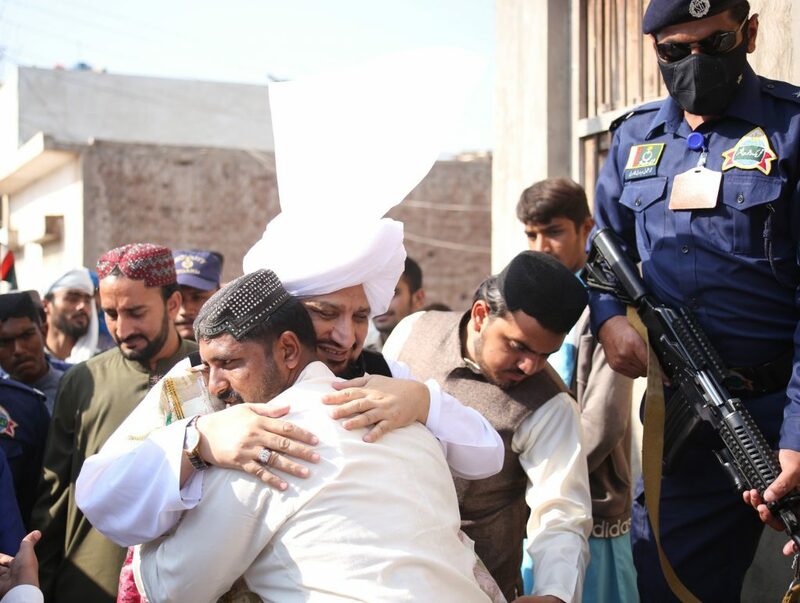 He invited Mohammad Aslam Awan for reciting some verses from the Holy Quran which warmed their emotions. Meaning: My spiritual guide is the Manifestation of Allah and the light of the Prophet. He is famous as Sultan-ul-Ashiqeen. It was very much admired by the audience and they felt replete with the love of their spiritual guide. The audience raised zealous chants for him. 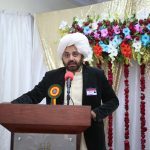 Meanwhile the host invited Sajid Ali for reciting the words of Pir Bahadur Ali Shah. He wrote this poetry in the honour of his spiritual guide which enlightened the followers’ inwards. At the end of the program Mohammad Farooq conducted prayers. The spiritual guide then moved to the room where a large number of people got the honour of having oath. As being impressed by his Divine personality they started the journey of the path of Divine gnosis. They also received eternal wealth of Ism-e-Allah Zaat. To this mob Zulfiqar Ali taught how to do invocation and contemplation of Ism-e-Allah Zaat. He also made them understand the method of inscribing the personal name of Allah on the body. There was a noticeable difference between their both conditions before and after oath (bayat). All the seekers of Allah were feeling tranquility and peace and their faces were glowing. 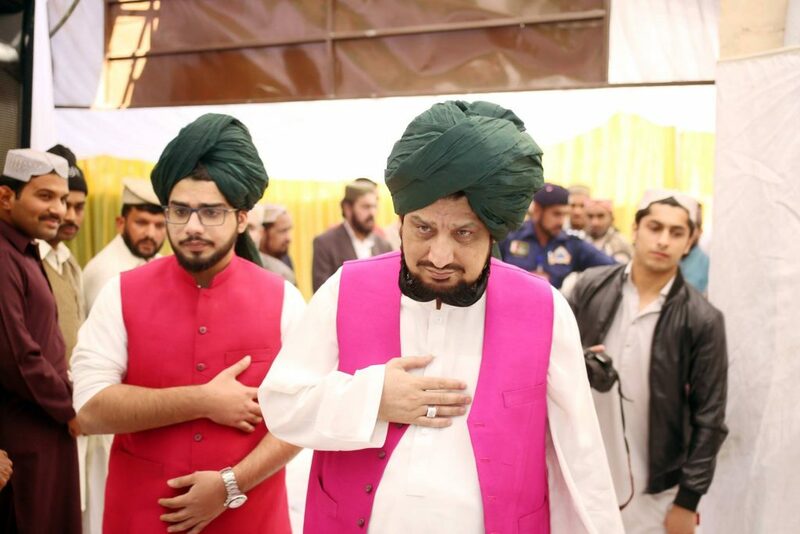 Being impressed by that spiritual atmosphere a number of people got the initial invocation of Ism-e-Allah Zaat without oath. 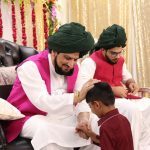 With the perfect spiritual guide’s permission Mohammad Arshad Ramzan taught them the method of invocation and contemplation. Afterwards the perfect spiritual guide took oath of allegiance of ladies of the house and the ones from the suburbs. 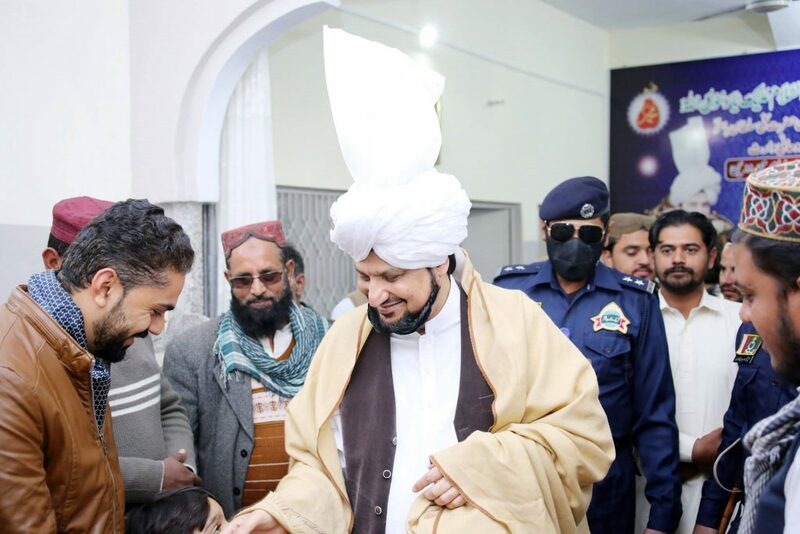 They met him and got the spiritual calm from his mesmerizing personality and his gift of Ism-e-Allah Zaat. 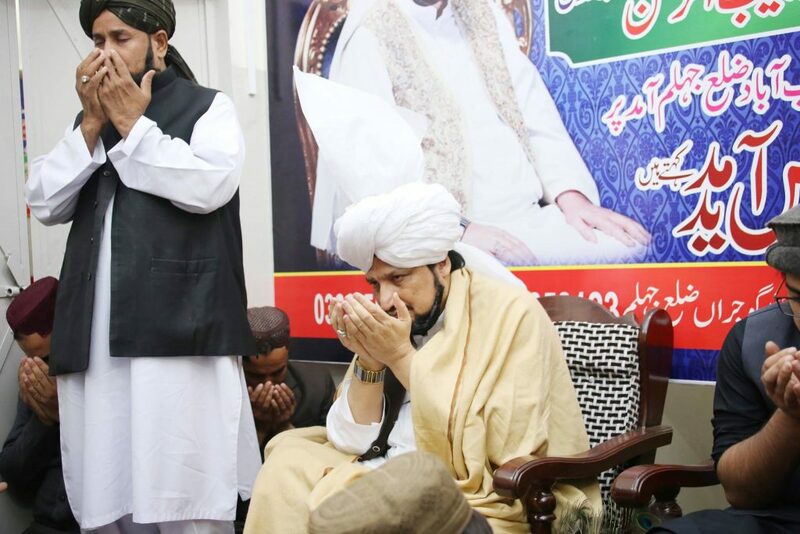 At last he prayed for Mohammad Afzal Sarwari Qadri and his family and left from there. Then he went to Fauji Mansab Ali’s place on his request and prayed for all of them. They were already standing there for his reception and were waiting for him anxiously. After that Sultan-ul-Ashiqeen alongwith Sahibzada Murtaza Najib and several disciples visited the place of Mohammad Zaman Khan. He conveyed to them blessings where the tea was served to the guests. The perfect spiritual guide prayed for the family and left. 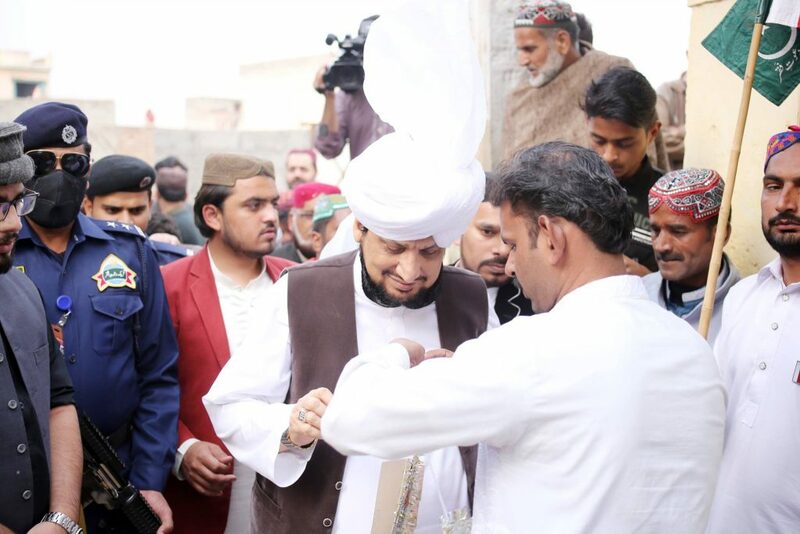 Then he blessed the homes of Mohammad Tariq and Mohammad Kashif turn by turn. He was warmly welcomed and people of both the houses were delighted to feel the beneficence of his presence. Explanation: Listen! I have found the secret of the Beloved and that is infact the Sustainer has worn the attire of man God has manifested in the guise of man. The audience liked it very much and became spiritually refreshed. 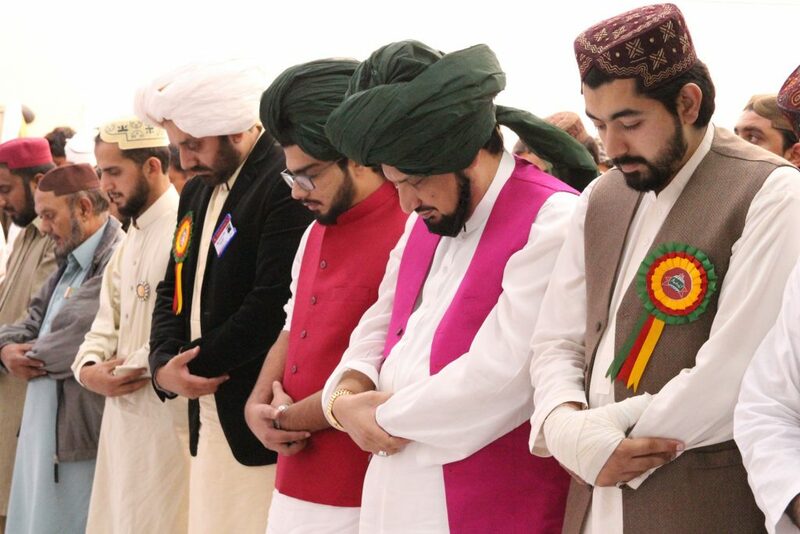 The ending prayers were conducted by Mohammad Farooq Zia Sarwari Qadri. The devotees from far flung areas had arrived to meet the perfect spiritual guide Sultan Mohammad Najib-ur-Rehman. They also took oath of allegiance at his hands and had the honour of being his slaves. He granted them Ism-e-Allah Zaat. By his permission Mohammad Zulfiqar taught the fortunate ones the method of invocation and contemplation of Ism-e-Allah Zaat. He also taught the method of practicing the personal name of Allah on the body. 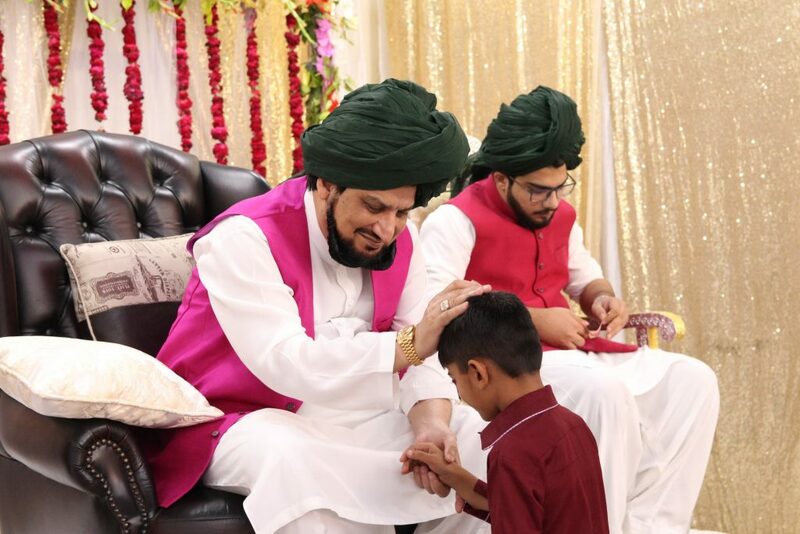 Sultan-ul-Ashiqeen prayed for them. The ones who did not get the honour of taking oath of allegiance got the initial stage of invocation. At the end women from the suburbs requested to meet the spiritual guide. 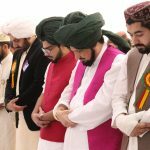 Sultan-ul-Ashiqeen listened to their appeals attentively and prayed for them. 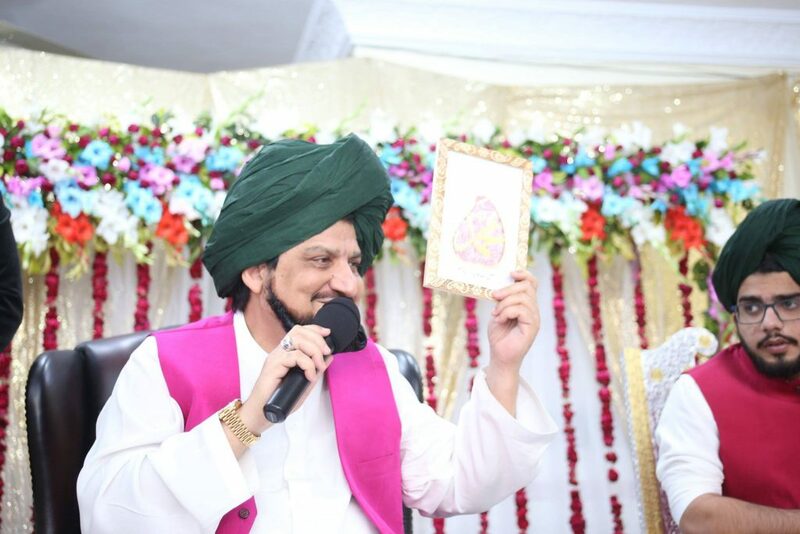 A large number of ladies were blessed by having oath of allegiance at this hands receiving Ism-e-Allah Zaat. May Allah they all be destined to remain firm on the path of Faqr and gnosis. After final meeting with Mohammad Asif Sultan-ul-Ashiqeen and Sahibzada Murtaza Najib alongwith other disciples left for Lahore. On his return he embraced every disciple and prayed for them. 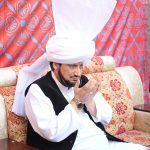 May Allah the beneficence of our spiritual guide continue forever. Ameen! 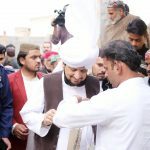 Sultan-ul-Ashiqeen visited Kala Gujran Jehlum and Bharot Sarai Alamgir District Gujrat on 9th December Sunday for one day. A week before this tour the preachers had gone to Jehlum at the office of Tehreek Dawat-e-Faqr for meeting Zafar Iqbal. 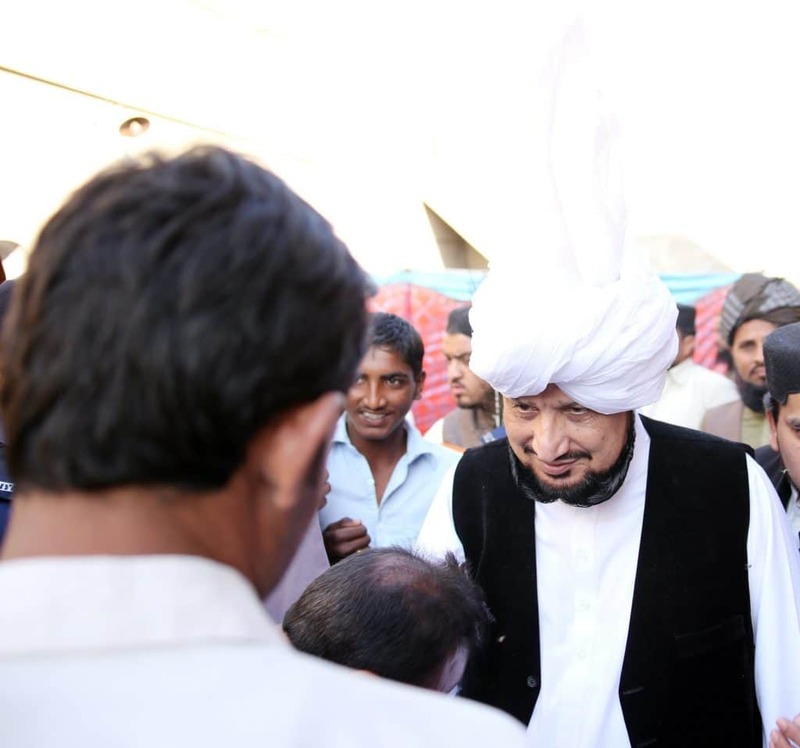 He had visited every nook and corner to announce the arrival of Sultan-ul-Ashiqeen Sultan Mohammad Najib-ur-Rehman. 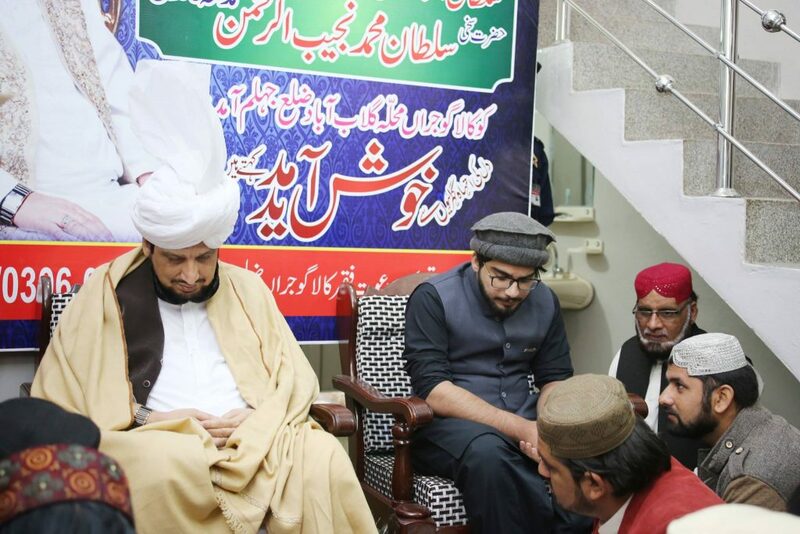 He informed the masses in detail about teachings of Faqr and the beneficence and blessings of Ism-e-Allah Zaat. He had told them the significance of taking oath of allegiance at the hands of the Divine Universal Man. They also distributed invites among their acquaintances. 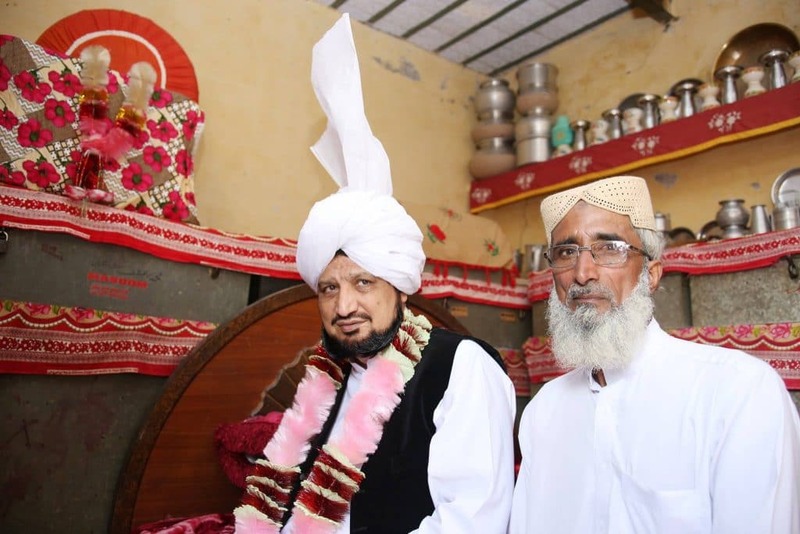 Zafar Iqbal is the disciple of Sultan-ul-Ashiqeen in Kala Gujran Jehlum who invites him to Jehlum every year. 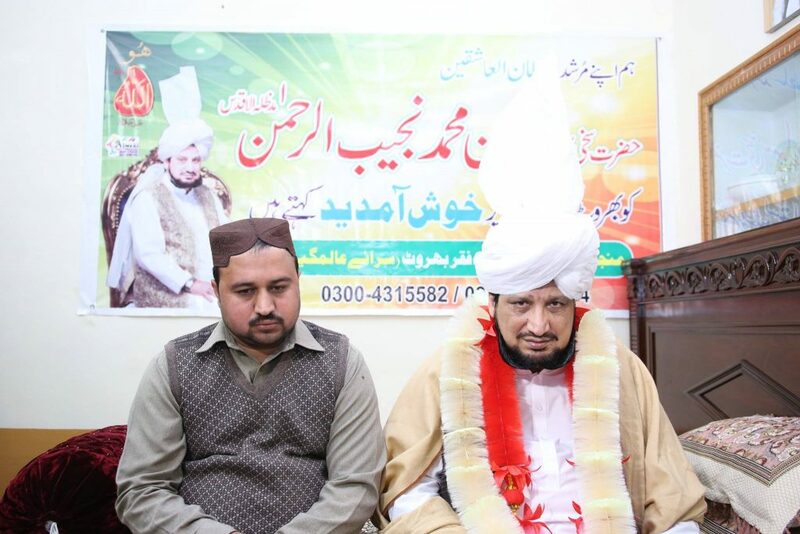 Infact, he preaches about the benediction of Ism-e-Allah Zaat in his area. 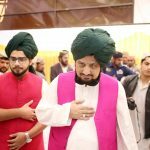 Finally, the caravan of Sultan-ul-Ashiqeen left for Kala Gujran Jehlum along the followers and the administration from Lahore. They left Lahore on 9th December 2018 in the morning 7 o clock. The caravan reached at 10:30 am in Kala Gujran Mohallah Gulababad Jehlum at Zafar Iqbal’s place. 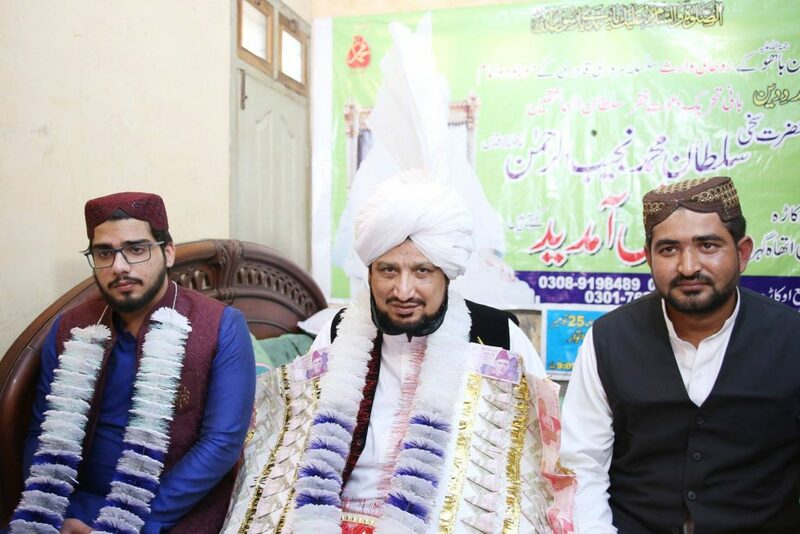 He alongwith the members of Tehreek Dawat-e-Faqr and the locals received the spiritual guide and Sahibzada Murtaza Najib. They received them with the zealous chants of Allahu Akber and prophethood. The devotees were waiting to see him because the news of their arrival had been delivered. 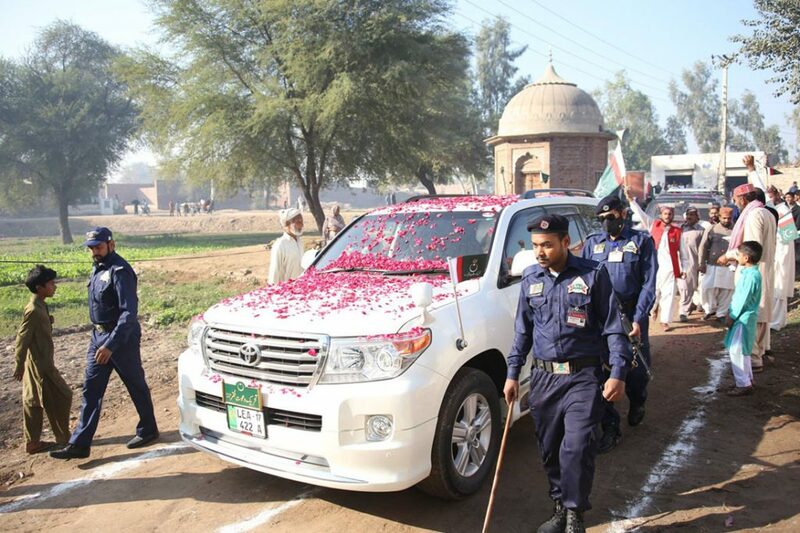 As soon as his Land Cruiser arrived near Zafar Iqbal’s house, the lovers showered rose petals. The entire atmosphere echoed with the religious chants. 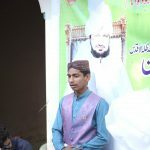 They celebrated Mawlid at Zafar Iqbal’s house to establish the importance of invocation and contemplation of Ism-e-Allah Zaat. In the beginning, Malik Mohammad Naeem Abbas the chief administrator of the movement of Faqr anchored the program. 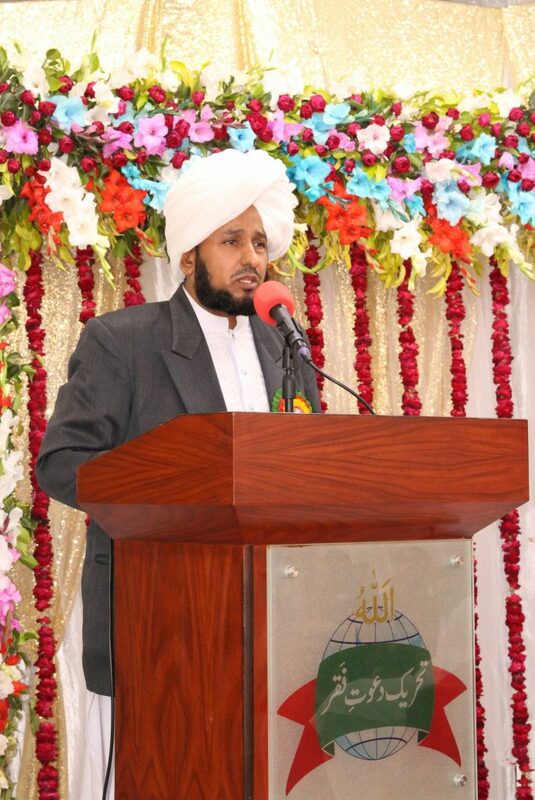 Professor Hammad-ur-Rehman initiated conference by the recitation of the Quran. Then Mohammad Farooq Zia described eloquently about the invocation and contemplation of Ism-e-Allah Zaat. 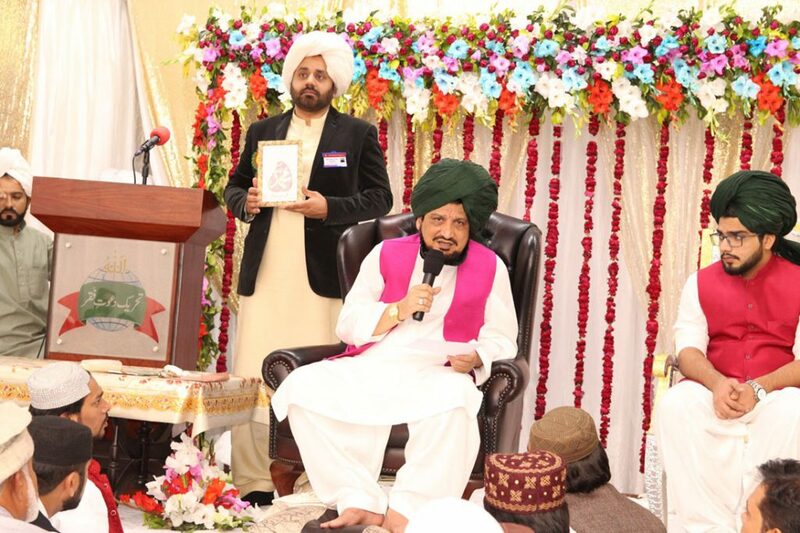 He also explained the need of oath of allegiance and the importance of recognition of the perfect spiritual guide. 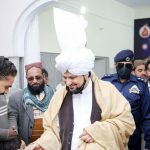 The fervent chanting of Takbeer and prophethood made the meeting more impressive. 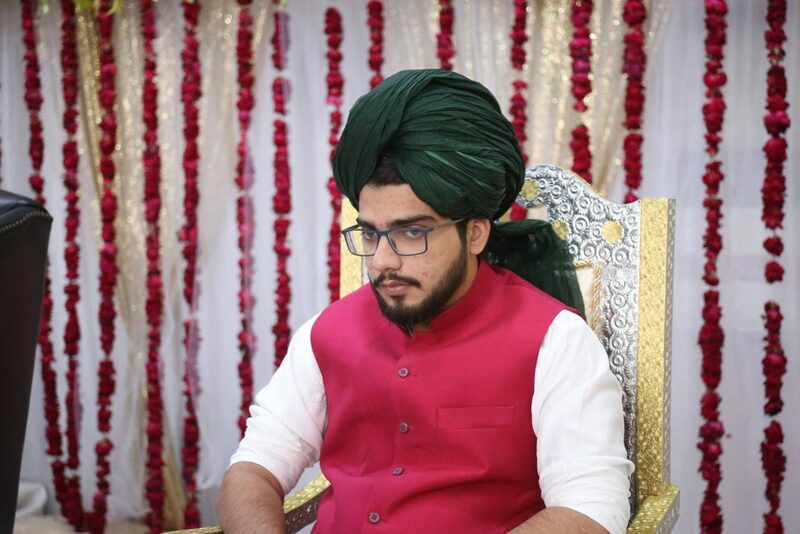 Later on, Sajid Ali recited in the honour of Sultan-ul-Ashiqeen a very beautiful devotional poem. Explanation: Our spiritual guide is the Divine Manifestation, refers to the Mohammadan Reality. 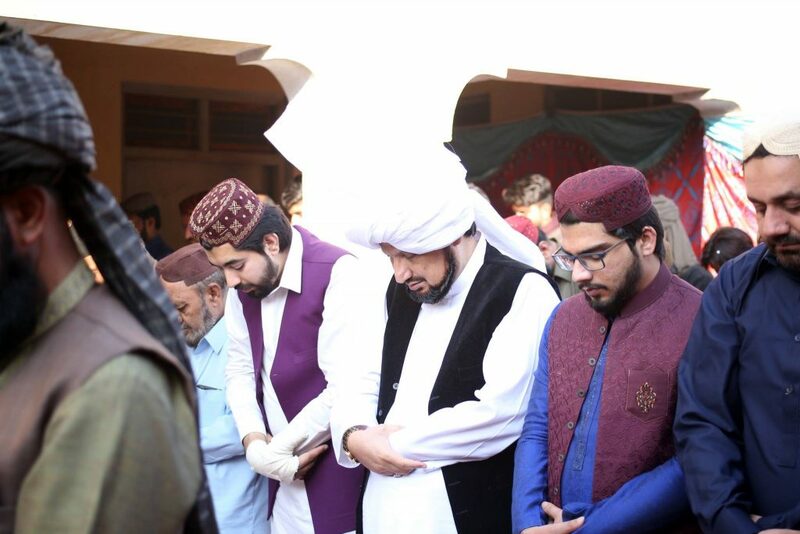 At the end, Mohammad Farooq Zia conducted prayer ceremony. However, for the purification of innerself, Divine nearness and gnosis, a lot many men and women took oath. 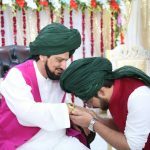 The spiritual guide blessed them with invocation and contemplation of Ism-e-Allah Zaat alongwith the Sultan of Invocations Hoo. After that they learnt the method of practice of inscribing the personal name of Allah on body. Zafar Iqbal gave a large langer to the audience after which the caravan left for Sarai Alamgir District Gujrat. 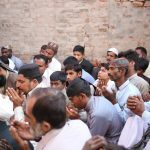 Devotees at Yasir Imran Sarwari Qadri’s house in Bharot Sarai Alamgir Gujrat was waiting for the Sultan-ul-Ashiqeen. Similarly, they received him warmly with the showering of flower petals and enthusiastic chants. 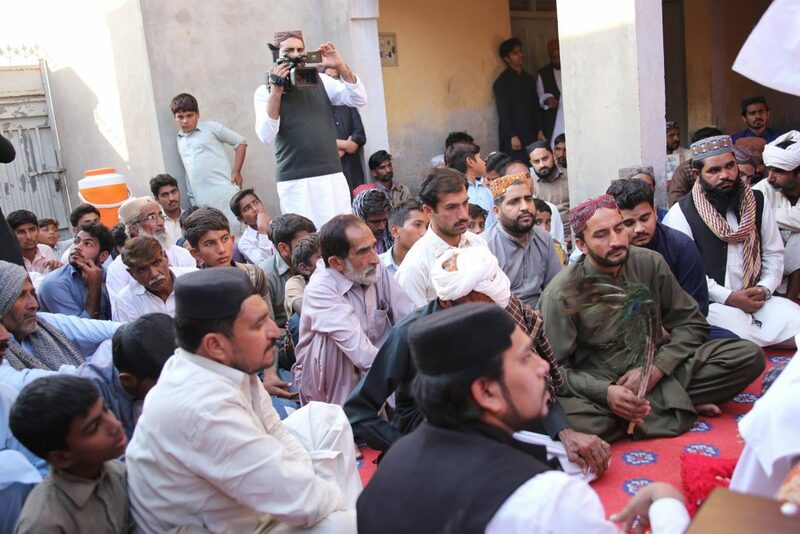 They offered Salat of Zohr at Yasir Imran’s place where the tea was served with sweets. After which a number of people took oath of allegiance. Hundreds got the initial level of invocation for their spiritual betterment and esoteric guidance without taking oath of allegiance. After praying for the welfare of the house the caravan left for Kastila to Mohammad Tariq’s Place. 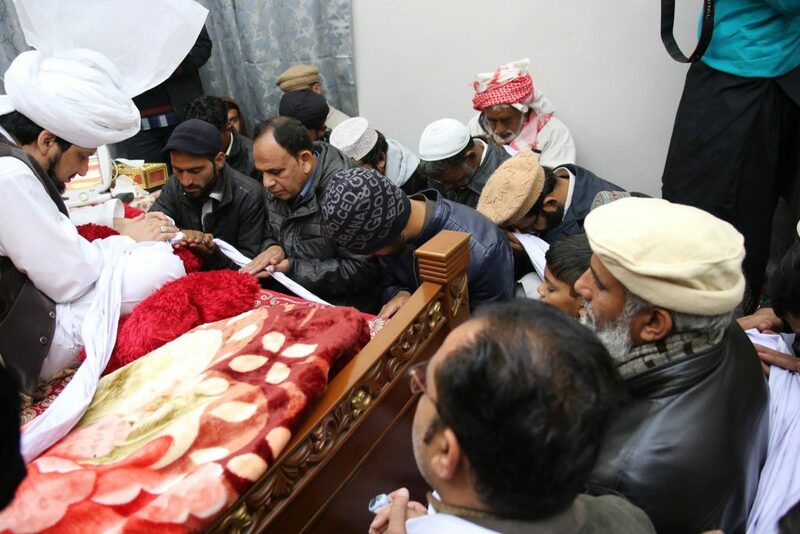 Followers received the spiritual guide at Tariq’s residence as usual with flowers and fervent chants. As soon as he sat, the followers stepped forward to kiss his hands respectfully. He met them one by one. First of all men got the honour of taking oath of allegiance. After that ladies took oath of allegiance at the hands of Sultan-ul-Ashiqeen. They learnt the method of invocation, contemplation of Ism-e-Allah Zaat. They learnt Sultan of Invocation ‘Hoo’ and the practice of inscribing the personal name of Allah on the body. The spiritual guide met his disciples and devotees, prayed good wishes for them. Then the caravan set off for Lahore. At last, the office holders and the hosts from Jehlum and Bharot bid farewell to the caravan. The farewell echoed with chants at the outskirts of Sarai Alamgir. Finally, the caravan concluded its Islamic missionary tour distributing the benedictions of Ism-e-Allah Zaat enthusiastically.